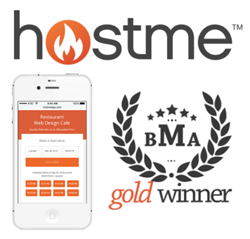 Hostme applied for and won Best Mobile App’s (BMA) award in its very competitive “Best Designed Mobile App” category. BMA hosts awards in several categories for highly popular mobile applications that seek to capture increasingly valuable screen space on millions of consumers’ mobile phones. The Hostme app helps restaurants seat more and spend less through its advanced 24/7 reservation and table management software. It streamlines front-of-the-house operations, eliminates costly no-shows, boosts return business, and increases staff satisfaction. It provides email and SMS notifications for restaurants and their customers, including facilitating chat capabilities with customers to keep them in the loop on their reservation or waitlist status. Restaurants can also send customers promotions to fill more seats during slow times. More significantly, it makes operations accessible via any mobile device — in nine different languages. BMA prides itself on a non-biased process in selecting the best mobile app award winners via a committee of highly experienced app designers and developers. These leaders of the industry are dedicated to uncovering the next big player in mobile applications. BMA covers all markets, from Android, iPhone, Blackberry, and Windows Phone to wearables like Android and Apple Watch, to ensure every app gets a chance to be considered among the best there is, regardless of operating system. BMA’s strategy has always been to focus on recognizing great apps and app developers. In this regard, the Best Mobile App Awards (BMAA) fully understands the process it takes to get a new mobile app recognized and into the public spotlight. Founded in 2014 and based in Washington, D.C., Hostme provides restaurant owners and operators around the world with fast, intuitive, and flexible front-of-the-house systems for restaurants at a sensible price point.